Think green and clean or flower power or planet health equals earth’s wealth. Two April days, which isn’t much in the year’s calendar, are particularly set aside by people and organizations that care about planet Earth to keep it healthy and beautiful. Earth Day is April 22 and Arbor Day is April 29. For Earth Day, enjoy gardens and community projects in the Andersonville neighborhood. Join with Lake County Forest Preserves naturalists for Bat Monitoring or a Woodpecker Walk. Take the Cardboard Challenge at Vernon Hills’ Hawthorn Mall. Or Party for the Planet at Brookfield Zoo. The following weekend, head over to the Morton Arboretum for a Build-a-Tree workshop, Dress like a Tree or pick up a plant during a special sale. These are a few of the activities to put on the April calendar. 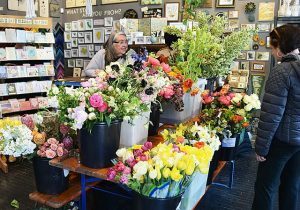 Marguerite Gardens pops up at Foursided at the 2017 Andersonville Flower and Garden Show. Photo courtesy of Anderson Chamber of Commerce. Head over to the area around 5000 North Clark Street April 21-22, where more than 30 businesses and organizations will be participating in an Earth Day weekend. Look for a garden gnome bearing a number to see participants and match it with the Anersonville Flower & Garden show booklet at any of the locations. Activities include landscaping demos by City Spaces Landscaping & Design at the Guesthouse Hotel (4872 N. Clark St.). For a list of participants visit Andersonville Flower & Garden Show Events. The Forest Preserves have a week of Earth Day activities planned ranging from Acoustic Bat Monitoring, Guided Nature Paddle and Woodpecker Walk to animal encounters and native plant landscaping. For dates and times visit LCFPD calendar. 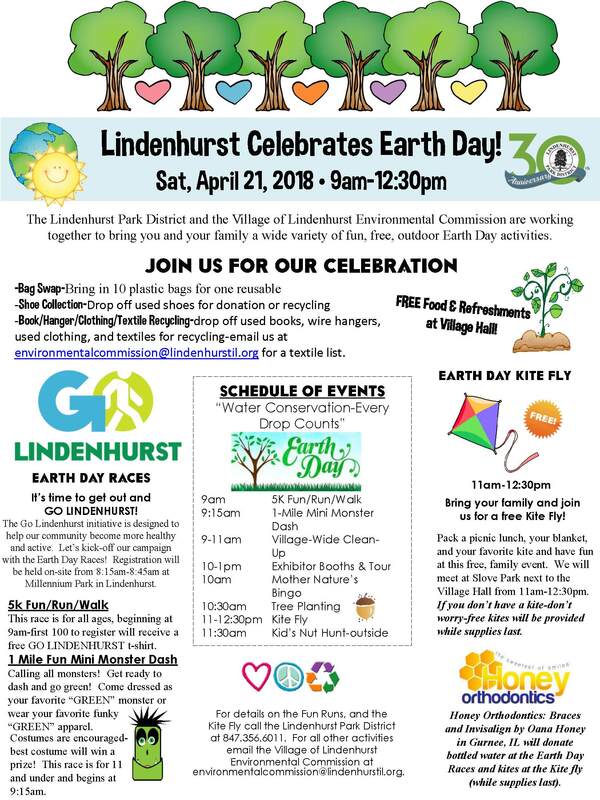 Get to know the far northwest suburban town of Lindenhurst which will have an Earth Day Kite Fly on April 22 and closet recycling opportunity of clothes, shoes and hangers and also bring used books and plastic bags. For times and more information visit Lindenhurst Celebrates Earth Day. Go over to the Hawthorn Mall in Vernon Hills from noon to 4 p.m. for face painting and a Cardboard cCallenge Scavenger Hunt. Sponsored by Kohl’s Children Museum, Northern Illinois Food Bank, The Museum of Science and Industry, SWALCO and the Vernon Hills Park District, the event is free but to meet the Trolls, bring five non-perishable food items. For details visit Hawthorn Mall Earth Day. Brookfield Zoo guests can help plant a tree or pansies and take home an oak sapling and acorn seeds (while supplies last) during the zoo’s party April 22 from 10:30 a.m. to 4 p.m. There will also be the popular Zoo Chats, an etching art activity and an EcoExpo to find out more on how to save the planet. To celebrate the day, parking will be free to guests who bring at least one approved recycle item to its First Avenue lot at 8400 31st Street, Brookfield. From 9:30 a.m. to 3:30 p.m. The zoo will also be offering free parking in its main north lot, located at 8400 31st Street (First Avenue and 31st Street) in Brookfield, to guests who bring in at least one approved item to recycle between 9:30 a.m. and 3:30 p.m. For a complete list of approved items being collected go to the zoo’s website at CZS.org. Items not being accepted are televisions, CRT monitors, large appliances, hazardous and chemical waste, smoke detectors, and wooden speakers. Items should be delivered unboxed and free of excess packaging materials. Party for the Planet activities (excluding activities inside Hamill Family Play Zoo) are free with general zoo admission of $21.95 for adults and $15.95 for children 3 to 11 and seniors 65 and over. Children 2 and under are free. Parking is normally $14. For additional information, visit CZS.org/PartyforthePlanet or call (708) 688-8000. Some fun tree events take place each weekend at the Morton Arboretum in Lisle, but to celebrate anyone who dresses like a tree on April 27 will be admitted free. There will be activities in the Children’s Garden and a plant sale all weekend. For more information visit Morton Arbor Day.